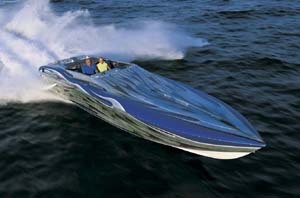 The owner of this 341 states that the boat is in fantastic condition! electronics installed - North Star GPS, depth finder, JVC stereo system, satellite- serious radio, North Star radar, Back up camera, dual AC and heater- bow and stern trusters - Jensep. recent upgrades - Water heater (recently replaced year ago) recent work done - Risers and manifolds were replaced 2 years ago. Tune up and maintenance. Last year cell fuel pump replaced. Battery charged was replaced last year. While many cruising yachts less than 40 feet in length are best-suited to overnight or weekend stays, Meridian's 341 Sedan has redefined the class by providing the comfortable accommodations and extra features you need for extended cruising. This cruisability incorporates accommodations for four in two spacious staterooms, a full-service galley with all the amenities and an airy salon with opening windows, panoramic views and entertainment center with 20-inch LCD television, AM/FM/CD/DVD system and both salon and bridge speakers. 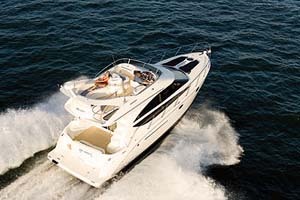 And, like the rest of the Meridian Yachts 2007 fleet, she also offers standard underwater exhaust and a variety of available Northstar navigation and communications systems. The 341 from Meridian redefines just how much cruising comfort you can design into a compact sedan. 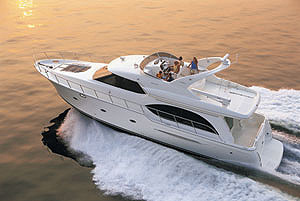 Mercruiser engines with only 310 hours! 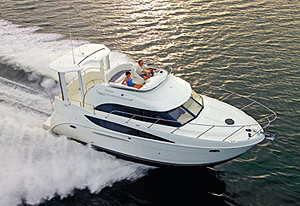 All details of this vessel, including engine hours and speeds, are as stated by the manufacturer, or Yachtworld.com, or the owner. The Castaways Club, Inc. does not guarantee or warrant the accuracy of this information, nor warrant the condition of the vessel. A buyer should instruct his agents, or his surveyors, to investigate such details as the buyer desires validated. This vessel is offered subject to prior sale, price change, or withdrawal without notice.